Bree and John’s wedding at Cadhay House was such a special day. Cadhay House itself was the perfect venue for them – a beautiful Elizabethan manor house in Devon, near Exeter in Ottery St Mary. Although it’s only ten minutes from Exeter it feels like the middle of nowhere! And there is no shortage of beautiful backdrops – which makes Cadhay House wedding photography such a treat! The house itself is at the end of a long drive. It has beautiful gardens with wide borders packed with colour in June and a large lake overlooking the countryside. Bree and John’s close friends and family made the most of it, staying at the house before and after the wedding – with Bree and John themselves staying on for their honeymoon afterwards. The house totally absorbed Bree and John’s personalities, reflecting their warmth and loveliness. 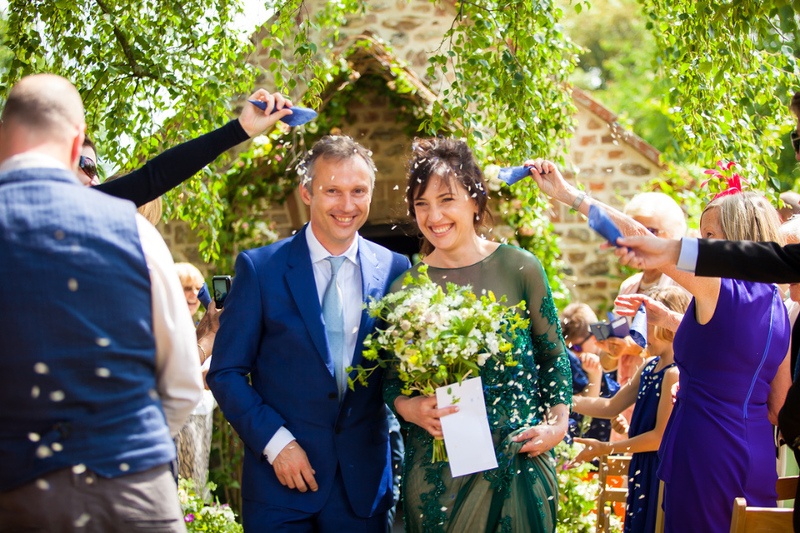 Bree chose to get married in a stunning, hand-sewn green dress and was joined by family who had travelled from Australia. Children had a teepee with games and toys to keep them entertained – although a lake full of froglets was much more appealing! The Cadhay House Tea Room was really simply and beautifully decorated, with paper lanterns, a light curtain and organza on the brick walls and gorgeous local flowers by In Bloom Devon. I felt truly honoured to be Bree and John’s photographer – and left them feeling like part of the family! © 2016 Rachel Ulph Photography | Hampshire Wedding Photographer|ProPhoto Website Design by Northfolk & Co.